It has become our tradition of sorts to make costumes that light up and have a coin-operated or vending machine theme. In years past, we have made a a candy machine, a jukebox and a fortune teller. This Halloween was no exception. This year we stayed in the arcade, and our challenge was to create a pinball machine that lit up, had sound effects, and was lightweight enough so that the wearer could trick-or-treat with relative ease. 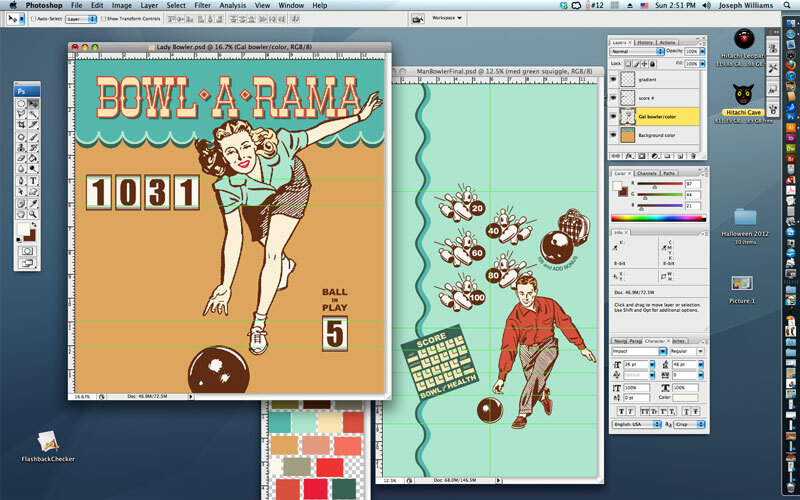 I wanted it to have a retro feel, so I researched pinball machines from the 1950s and decided to go with a bowling theme. The artwork was created in Photoshop and Adobe Illustrator. 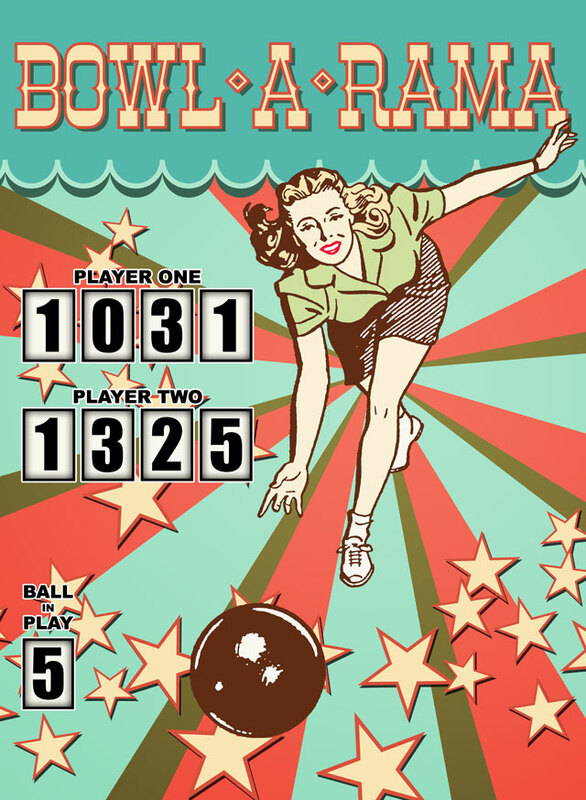 I didn’t stick religiously to any particular machine, instead I took inspiration from a number of old machines I looked at and combined elements with some fun bowling illustrations. I experimented with color; Joe threw some of his notions into the mix, and we printed the final result out on an Epson R1800 printer. The paper was thin enough so that we could light our back glass and have it look like the real deal while trick-or-treating. 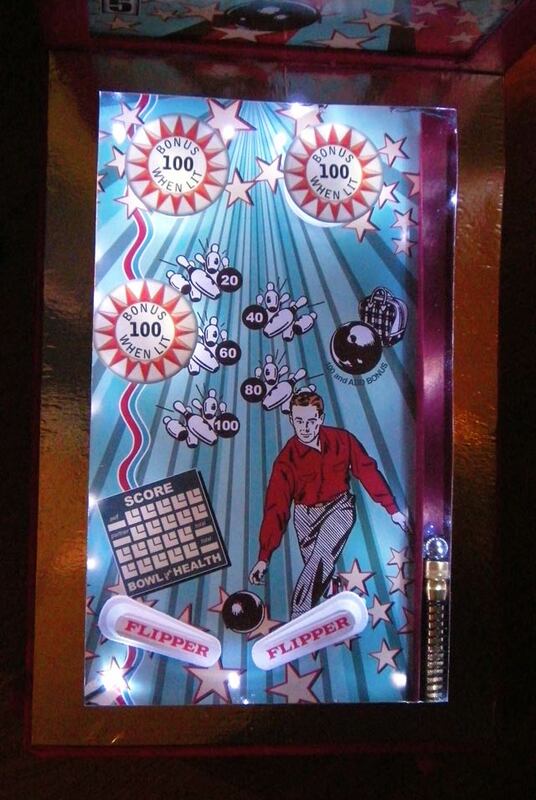 The Pinball Machine started as a U-Haul, 15″ x 15″ x 48″ sports equipment storage box. Joe made a small scale model out of paper to determine how the box was going to be cut, and I sat at the computer to work on the bowling themed graphics. The back glass portion that our Trick-or-Treater would fit into and the game board were all part of the same box. We went online and purchased a 1″ ball bearing and a string of battery operated blinking LED lights. Then we looked around hardware, dollar and junk stores for inspiration. There we found bits and pieces that serve as pinball machine parts such as door stops for the flippers, and translucent sauce cups for the bumper bases. 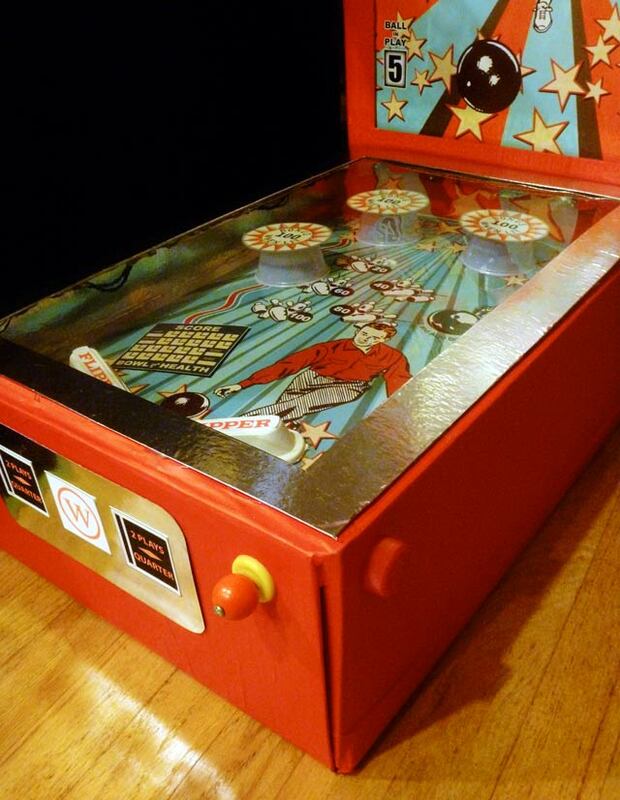 And now, some shaky and hastily edited video of the Pinball Machine Costume in action! 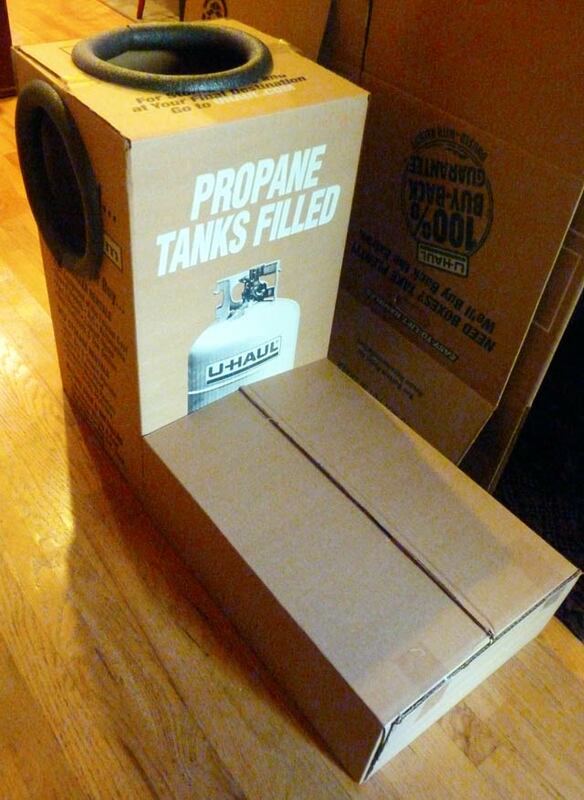 This entry was posted in Halloween, Holiday and tagged arcade, bowling, cardboard, costume, DIY, electric, Halloween, handmade, holiday, Joe Williams, kid, LED, Philadelphia, pinball, retro, Tina Garceau, U-Haul. Bookmark the permalink.